The benefit of a holiday is that it's a break from a general routine. On the sixth day of a walking holiday I was into another (more desirable) one. I was almost fit enough in health and spirit for more weeks of it. Alas, one week was all that I/we had time for. My preparations for this walk began in March and they paid off. One knee is still weak but no longer painful. There were no blisters on this walk. The soles of my feet are still an issue but less so. They ache after an hour or so of walking but it is an "ache" rather than pain, and easily remedied with a short halt or the occasional longer stop with boots and socks off. I'm more than hopeful that more weight loss plus another appointment with the podiatrist and the osteopath will bring further improvement. I was very pleased with the kit except for the sleeping bag and perhaps the boots (See my kit list and previous posts for details). The sleeping bag was warm but I realise now that I need a more spacious bag for a comfortable nights sleep. The boots look and feel good but I am going to try another type for comparison. It didn't feel as if we had "roughed it" on our holiday. It was a pleasure to camp out in the good weather that we had. The overnight rain whilst we camped at Cote Ghyll camp site, Osmotherley was not a problem but the site was and the midges that live there made it an unpleasant experience. The staff were disorganised and unhelpful, the site is cramped and muddy. There is one decent toilet block and another not so decent. I wouldn't use that site again. I suspect that some of the other campers who I saw, and certainly those that I spoke to, won't either. Garbutt Farm, Sutton Bank was at the other end of the scale; it is an outstanding Bed & Breakfast. The accomodation is luxurious and the breakfast excellent. Our vehicle was parked there whilst we were away. 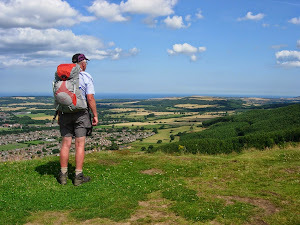 It's almost on The Cleveland Way, within easy walking distance of a pub and a bus stop for The Moors Bus Service - a service which we used to return from Scarborough and collect our van. I owe a debt of gratitude to the many (including ourselves) that wished us luck - we received it and used some to good effect. Special gratitude is due to Alan Sloman - a walker extraordinaire, reluctant gear freak and altogether nice guy who gave us such good advice and encouragement. Thank you Alan. I'd like to thank Bryn too, for being such a good son and the perfect companion on The Cleveland Way 2009. And very well done! Clambering up big hills whilst texting - amazing. Incredibly well done Brian (& Bryn). To Lose twenty pounds of weight in five months and twenty pounds from your rucksack in twenty odd years and start all over again is a brilliant effort. It just proves what can be done when you know what you want to achieve. I have thoroughly enjoyed your blog since the start and am so looking forward to you continuing.